iPhone backup enables iPhone users to restore their iPhone to get back deleted or lost data. This is the only official way to recover iPhone data. However, there are many limitations to restore iPhone with iPhone backup files from iTunes and iCloud. Today in this article, I will introduce you a better way to extract data from iPhone backup. You are allowed to preview the data and restore iPhone data selectively from your iTunes backup file and iCloud backup file. Why people need iPhone backup extractor if they can easily restore their iPhone with iTunes? The most important reason is iPhone backup extractor allows users to preview data before restoring. And users are allowed to extractor selected data from backup instead of restoring all the data from backup file to your iPhone via iTunes. 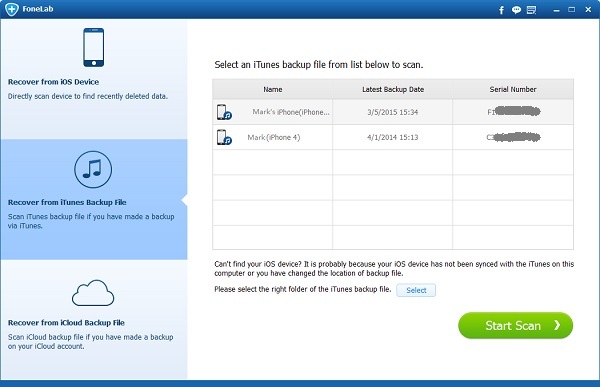 It can scan your iPhone backup file deeply and find all the data in your iPhone backup. After selecting and previewing the data, you can easily extract text messages, iMessages, photos, videos, contacts, notes, call history, reminders, calendars, voice memos, Whatsapp messages and many other data you have in your iPhone backup file. Every time you connect and sync your iPhone with your iTunes, in this process, iTunes will make a backup file for your iPhone automatically. So if you once sync your iPhone to your iTunes, you will have a backup file. That is to way, after losing iPhone data, you can find the iTunes backup file for your iPhone and extract the deleted data from backup file with this iPhone Backup Extractor. Launch the software and choose the second option in the main interface. After entering the section, you will see all the iTunes backup files saved in your computer. So you need to select the one you would like to use and click “Scan” button. The software will scan the backup file deeply and show all the data in your backup file on the interface. Tips: If you changed the default location of your iTunes backup files, you can manually add the iTunes backup file to this iPhone Backup Extractor. After that, you can continue to scan your iPhone backup. This software can extract photos, pictures, contacts, sms, notes and many other data from your iPhone backup files. Once it finish the scanning, you will find all the data listed on the interface. There will be a data menu on the left side of the interface. Go to each category and find the data you want to extract. Before you recover the data, you can easily preview the data. It is really important because this makes the extracting much more efficient. After selecting all the data you want to restore, click “Recover” button on the interface. The iPhone Backup Extractor will automatically extract the selected data from iTunes Backup to computer as soon as possible. You can easily find and check the extracted data on your computer. Doesn’t like the iTunes backup file, you need to enable the iCloud service from Apple and make a backup file before you can extract iPhone data from iCloud backup file. Free download, install and run this iPhone Backup Extractor. 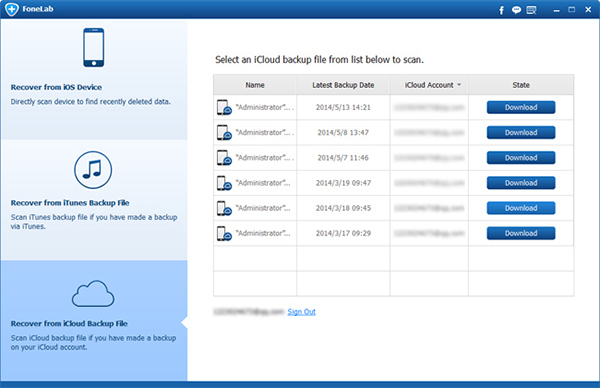 Select the third option on the interface – Recover Data from iCloud Backup File. You need to log in your iCloud account.You will see all the iCloud backup files in your account and you need to select one to download. 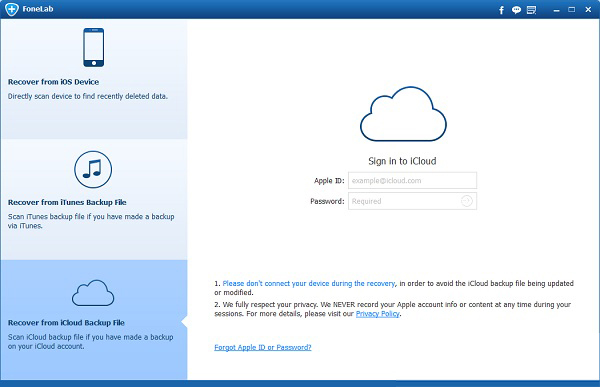 After downloading, the software will begin to scan your iCloud backup file. Once the software finishes the scanning, it will list all the data in your iCloud backup file on the interface. The data menu on the left side will help you to find the data you want to extract easily. You can preview the photos, text messages, contacts, notes, calendars, call history, videos, Whatsapp messages and other data before extracting. This iPhone Backup Extractor will save all the data you want to your computer. You can find them easily after recovering. All in all, iPhone backup extractor is your best choice if you would like to recover data from iPhone backup. The operation is really easy to understand and follow. It enables you to restore iPhone backup file without Phone, extract data from iPhone backup file selectively and preview data before recovering. Once you have one, you will never worry about lost data on your iPhone. The last but not the least, to avoid losing data from iPhone, you need to make iPhone backup files regularly.